Some Reno Justice Court forms require a digital signature in order to submit the form on-line or by email. A digital signature is the equivalent of your written signature and has the same legal consequences. Creating a digital signature is easy. However, if it is your first time using a digital signature, it will be necessary to complete a few extra steps. Forms on our website, that require digital signatures, are .PDF files. Download and install the latest version of Adobe Acrobat Reader to ensure that our forms will work for you. If you already have Adobe Acrobat Reader installed, please proceed to step 2. If you do not have Adobe Acrobat Reader, please click the link below to download and install. Right click on the link and select 'Save link as...'. Save the form to your 'Desktop' or another easy to find file location on your computer. Open the form and complete the required fields. Required fields will be highlighted with a red border. 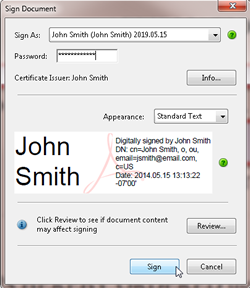 Proceed to step 4 when you encounter a digital signature field. 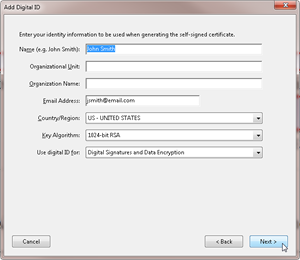 Click on a digital signature field to open the 'Add Digital ID' wizard. Follow the steps below to create your digital signature. Select 'A new digital ID I want to create now' and click next. Select 'New PKCS#12 digital ID file' and click next. Fill-in your name and email address. Leave default selections and click next. You can leave the default selection for the 'File Name' or select a new name and location. Enter and confirm your password. Click finish. NOTE: This password is only accessible to your digital signature file and is not transmitted with the form. Your digital signature has been created. The 'Sign Document' wizard should open automatically. If not, click on the digital signature field again. Select your name from the 'Sign As' option, enter your password, and then click sign. At the bottom of the form click the 'Click Here to Email' button. This will open your email client and attach the PDF form to be submitted.